A slushy is a frozen beverage made from either a carbonated or noncarbonated drink. Slurpee is the brand name of a popular slushy made by the national convenience store chain, 7-Eleven. 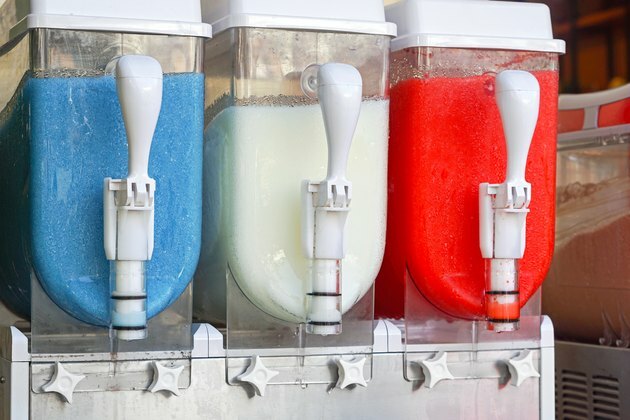 The ICEE, which preceded the Slurpee by about 15 years, was invented by an owner of a Kansas Dairy Queen who accidentally froze a bottle of soda. Today, slushies are a common snack drink sold at fast food restaurants, convenience stores and supermarkets. Slushies are generally made in a special freeze and carbonation machine. Slushies are made in practically any flavor you can imagine using natural juice, juice from concentrate, colas, as well as artificial flavors and colors. The nutritional content depends on how your beverage is made. According to the company's website, a 6 oz. cherry ICEE has 80 calories, 20 g of carbs and 10 mg of sodium. An 8 oz. Coke Slurpee from 7-Eleven has 65 calories, 18 g of carbs, 6 mg of sodium and 18 g of sugars. At one time, cherry, blueberry, then Coca-Cola once dominated the slushy market. Today, you can get Jolly Rancher green apple or watermelon flavored beverages by ICEE containing 140 calories in a 16 oz. serving. A French Vanilla Java Freeze, also by ICEE, contains 220 calories in an 8 oz. serving. Slushy's in flavors ranging from ordinary cherry to low calorie Crystal Light Raspberry Ice Slurpee, once a staple of convenience stores, are available in markets and fast food restaurants. A new generation of slushies was created in the early 1990s when entrepreneurs, notably Kirk Perron of the chain restaurant Jamba Juice, reinvented the slushy. The smoothie is a frozen beverage that uses fresh juice and fruit. Yogurt or dairy gives the slushy an entirely different dimension. A classic 16 oz. smoothie, which contains milk, has 230 to 400 calories, 1 g of fat, 0 to 5 mg of cholesterol, 25 to 50 mg of sodium, 55 g of carbs and 49 to 85 g of sugars. An all-fruit smoothie, with fresh fruit and juice, contains about 210 to 340 calories and no more than 1 g of fat, according to the Jamba Juice website. You will increase your chances of getting a healthier beverage when you choose a slushy made from natural ingredients. While an original lemonade ICEE contains 0 g of vitamins and minerals, a Mocha Cappuccino Java Freeze contains 2 percent of the RDA of iron and calcium, trace amounts that will likely have very little effect on your health. ICEE Slush flavors, including strawberry, orange, grape and Lemonade, have 100 percent of the RDA of vitamin C as well as 2 percent of calcium. When aiming for the highest nutritional boost, stick with smoothies containing all-natural ingredients. A 16 oz. Jamba Juice smoothie can contain anywhere from 2 percent to 130 percent of the RDA of vitamin A, 6 percent to 10 percent of calcium, 15 percent to 110 percent of vitamin C and 2 percent to 8 percent of iron. You can increase the nutrient value of almost anything by making it at home where you can monitor how much natural ingredients go into your own concoction. A recipe that calls for using a drink mix such as Kool-Aid can have about 116 calories in a serving with more than 29 g of sugar and no added vitamins or minerals. While 1 cup of fresh, raw orange juice contains 112 calories, according to the USDA National Nutrient Database, it has 207 percent of the RDA of vitamin C, 10 percent of vitamin A, a variety of B vitamins and minerals.